THE MMO is offering grant aid of up to £2000 towards replacement Vessel Monitoring System (VMS) terminals for over 15 metre boats, with applications open until 20 February. Filling out a page of the Inmarsat C linked VMS log book for the MMO at sea. The introduction of VMS to these smaller vessels is now almost complete. The MMO is therefore now in a position to accept grant aid applications for replacement terminals for English fishing vessels over 15m. Once the MMO receives application forms and clarifies these meet the eligibility criteria it will contact the supplier, AST, who will in turn arrange for a time and date for installation. After AST install the device they will then invoice the MMO for payment. Application forms and further guidance is available from the MMO website. Failure to apply is likely to result in vessel owners paying at least £2,400 for the new device. For more information contact Ray Hedley on 0300 123 1032. The introduction of VMS to these smaller vessels is now almost complete. The MMO is therefore now in a position to accept grant aid applications for replacement terminals for vessels over 15m. 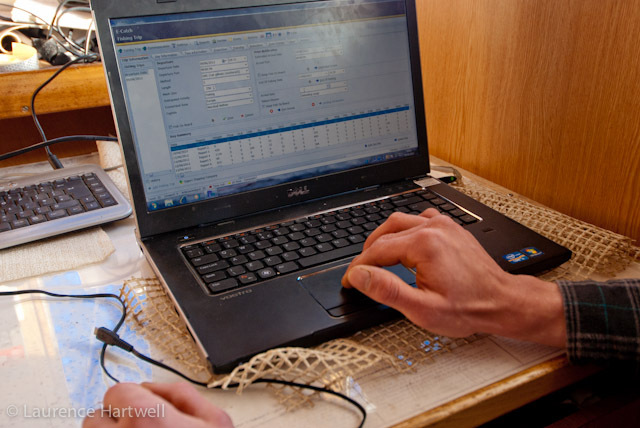 The MMO wrote to the fishing industry on 14 January about grant aid to upgrade the separate e-logbook software systems. The deadline for this was 6 February. Anyone who has not yet applied should contact the MMO as soon as possible.